Oooh! 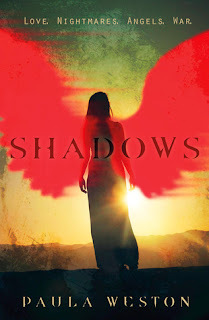 Shadows by Paula Weston was such an unexpected delight of a book. I say 'unexpected' because angels in general are a parnormal/supernatural creature that I tend to avoid like the plague. And for that reason, I did pass over the opportunity to read it when it first came out. ...And by the time of its publication I'd heard nothing but amazing things about it. So when I happened to see a copy of Shadows in my local library, I thought 'well, why not?' I sat down to read it on a particularly cold, miserable morning and I was completely swept away by it. I found Shadows to be very addictive reading, very exciting and by this point I'm absolutely gasping to know more. More about this story and more about these fantastic characters. First off, I loved the Australian setting of this book. I'd definitely like to read more YA from Australian authors such as Paula Weston. As much as I was enjoying Gaby's story, I kind of also wish there had been a gap in the action for Gaby and Maggie to head down to the beach and hang out for awhile. An idea for a future book in the series, I'm sure! I'm also very drawn to books involving memory. And in Shadows, Gaby is faced on all sides by people asking questions and making remarks about memories that she had lost following the death of her twin brother, Jude, the year before. It had to have been frustrating being confronted by and being put into situations in which other people know (or think they know!) more about you as a person, or about things that happened to you in your life that you no longer have access to. That is what it is like for Gaby and I really felt for her. She's already in a difficult position and these memory issues do not help things along. I loved Gaby as a character. She's chosen to live in a quiet town near the beach. She's got a great best friend, Maggie, and a job at the library. Her grief over the loss of her brother still eats away at her but she's trying her best. And then the man of her dreams (he actually appears regularly in her dreams) walks into the bar and everything that Gaby thought she knew about herself and her life begins to change. I thought the change in name from Gabe (her previous life) and Gaby (her current life) was quite cleverly done. Here's where we get into the angels part of the story. Usually I start rolling my eyes when it comes to the history and mythology of how the descendents of angels came about or what powers they have. But I didn't do that with this story. I found the information and world-building of these angels to be quite straight-forward and I was okay with the extra abilities. And Rafa is a fantastic character as well. There's plenty of swoon right from the beginning and I absolutely loved the tension between Gaby and Rafa. The chemistry between them was amazing. Shadows is filled with plenty of action and mystery. There are just enough fighting and heart-thumping moments to keep a very fast-pace. But there's also many questions raised that is making me feel a slight desperation for the sequel, Haze, in the hopes that some of my questions will be answered. I'm dying to know more about what happened to Gaby and Jude, who tampered with Gaby's memory, if Jason is hiding any more shocking secrets and oh my god, what will happen next with Gaby and Rafa?! I'm definitely hooked on this series. Tell me again why it took me so long to pick up this book? Also, stay tuned! Tomorrow, the author of Shadows and Haze, Paula Weston will be here on the blog with a special guest post. I love books set in Australia too! And I really loved this one. I am glad you liked this so much! It has been on my radar for a little while and it is supposed to be the next up and coming angel book! Thanks, Alex! It's a wonderful book. I'm not surprised that it has that reputation :) Can't wait to read the sequel.